If there is one person who might be upset with the performance of 2013 U.S. Chess Champion Gata Kamsky, it is former New York Jets coach Herm Edwards. I’m not sure if Edwards is a chess player, but his long-viral media tirade that proclaimed “Hello?! You play to win the game!” was a line of theory that Kamsky apparently overlooked for much of the past week. After a 4-0 start sparked whispers of a potential $64,000 Bobby Fischer Prize – awarded to any competitor who could match the national icon’s perfect score from the 1964 U.S. Championships – Kamsky went the remaining five games with no checkmate, only draws, skidding across the finish line of the nation’s most prestigious tournament. 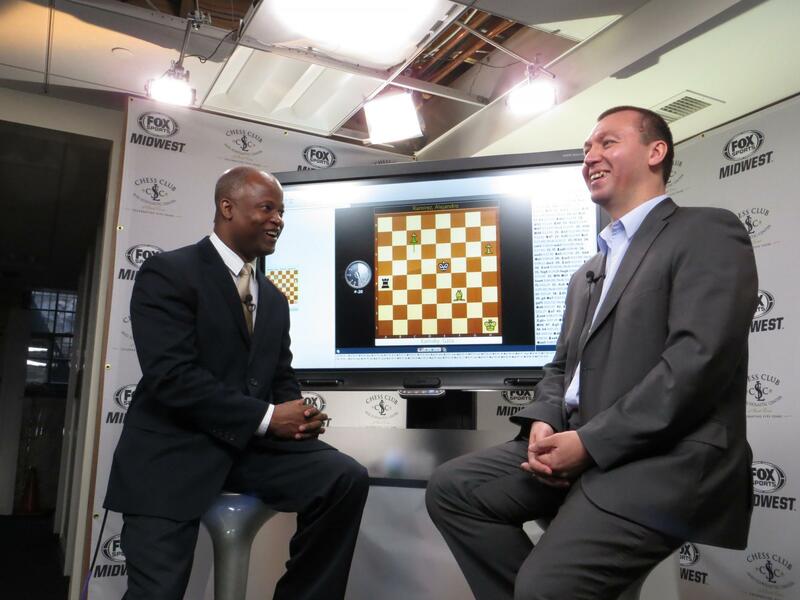 GM Maurice Ashley, left, interviews GM Gata Kamsky immediately after Kamsky secured his fourth U.S. Championship title. Alejandro Ramirez shifted into second gear while Kamsky treaded water over the second half of the competition. His final-round win over Larry Christiansen forced a playoff with Kamsky for the national title: two sudden-death rapid games, where they both had just 25 minutes on their clocks. And Kamsky, equally unwilling to win as he was to lose, again found his way to draws in both overtime games. The 2013 U.S. Championship was ultimately decided by one final “Armageddon match,” a showdown where the strategy begins off the board. Before the first move, both players silently bid how much time it would take them to achieve a checkmate – or draw – against his opponent. Chess is a game defined by the white pieces moving first, but the added bonus of drawing odds makes the black pieces the superior choice in the Armageddon match. An interesting twist. Perhaps proving that the highest level of chess is decided by the most intricate details, both players’ bids were separated by just 15 seconds. If his opponent was allowed 45 minutes to think, Kamsky believed he could win or draw with just 20 minutes on his own clock. But Ramirez thought he could command black to a decision with just 19:45. So there Kamsky was, controlling the same army of white pieces that had defied him for a week, this time with the gun finally to his head: Win this game, or go home. No floundering. No draws. You play to win the game. National champions are built under such demands. This is Kamsky’s fourth title. He is 38 years old, where Ramirez will turn 25 next month, a testament to the underlying theme of the entire 2013 tournament: The top 24 of our nation’s finest players, featuring the legends of yesterday versus the superstars of tomorrow. But the players with resumes two decades deep gave way to players not two decades old. Kayden Troff will forget his last few days as a 14-year-old, when he notched just one win through the first three rounds. He woke up a 15-year-old on May 6, however, and caught fire from his birthday candles, scoring two wins and four draws through the final six rounds. I can't put my finger on it, but there's irony in this, somehow: The day after Troff turned 15, he squared off against 12-year-old Sam Sevian, the youngest-ever to compete in history of the U.S. Championship. Stellar showings earned both of them a “norm” – that is, a mandatory performance milestone necessary to achieve the next title. Sevian is chasing International Master; Troff is now one step closer to Grandmaster. If any one youngster stole the show, however, it was 19-year-old Grandmaster Conrad Holt. The University of Texas-Dallas junior came in ranked 18th in the field of 24, but found himself in a three-way tie for second place entering the ninth and final round – only a half point behind Kamsky. There, he fought against second-seeded Timur Gareev and worked himself to a position of perpetual check which would have earned him a half-point draw. But after hearing that Kamsky had already finished with yet another half-point draw, thus leaving the door open for a potential playoff, Holt charged forward into a weakened position to slay Gareev’s king. The decision proved to be poor on several levels: He eventually lost the game, which elevated Gareev into a tie for third place, knocked Holt down to fifth and ultimately lost him thousands of dollars in prize money – but damn if you don’t love that fearless spirit out of the kid.